Yes, it gets confusing. There are two technologies out there with very similar names and yet they do the exact opposite. Our support staff deals with this one all the time, so that means there hasn’t been a good explanation out there that Google could find. You know what that means, right? Article time! Let’s say you want to put something far away from power. It might be a camera or a wireless access point, whatever, the point is that you have a network “thingie” and it needs to be at a great distance. Power-over-Ethernet is the solution there. Power-over-Ethernet lets a low-voltage current flow over unused wires in the ethernet cable. It’s enough to power an IP camera or an access point, but not enough to power something like a laptop (although it might trickle charge a cell phone.) This little trick relies on the fact that current and signal can travel on the same wire without really bothering each other. Power-over-ethernet does its magic using something called a “PoE Injector” which typically plugs into the wall. A network cable from the router or switch goes to it, and another cable (this one containing power) goes to your device. It’s safe and easy and a lot cheaper than running a long power line to wherever you need it. Folks at home can get away with extension cords, but businesses need to be “up to code” and that can mean expensive expansions when you need to add power. Adding network cable can be expensive enough, so why not just do one and not the other? 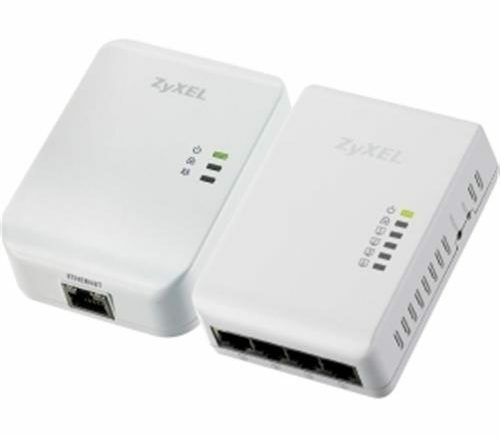 Not to be confused with Power over Ethernet, Powerline Networking (also referred to as “HomePlug”) lets you put a wired network connection anywhere that you already have an outlet. Again, you’re using the same trick that lets signal and current travel on the same line, but instead of using network cables, you’re using the copper wires already inside your home. For a powerline network, you typically plug a box into the wall with a cable going to the router. On the other side of the house, you plug an identical box with a cable going to the device. The network information passes harmlessly through your breaker box and finds where it needs to go. It’s not a perfect system as it relies on cables that were never intended to pass networking information and it doesn’t work at all if there is any sort of insulation between breakers or if you have more than one breaker box. But it’s a cheap and easy solution for homeowners who want a wired network connection where there just plain isn’t one. Power-over-Ethernet uses Ethernet cables to power something where there isn’t a plug. Powerline networking uses the copper power cables you already have to bring Ethernet to a place where there isn’t a network port. Lucky for you, Solid Signal sells both, and with just a quick search or a call to 877.312.4547, we can help you find exactly what you need.